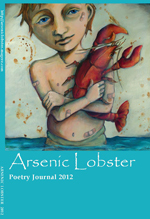 Arsenic Lobster Poetry Journal, 2012. Editor: Susan Yount. Chicago, IL. 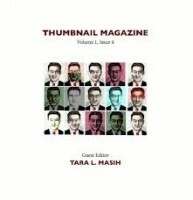 This is a print anthology of the online issues 26, 27, and 28 of Arsenic Lobster, a journal of post- experimental poetry. When I was just starting out, Arsenic Lobster was one of the journals I wanted to be in because, well, it’s named Arsenic Lobster. I was rejected pretty steadily, as I was from most journals, but I kept AL in high esteem. This is mostly because it continues to publish out-of-the-box poetry. Interesting poetry. And lobsters. and burning buildings engulfs Sendai’s airport. Simon Perchik, one of the most widely published and yet somehow still unknown poets, contributes two poems. The mad god Rob Cook contributes an elegy for a murder victim called “Elegy for Robert Adams-Cap (1989-2005).” Ricki Garni. Malaika King Albrecht. Maureen Alsop. Michaela A. Gabriel. There are so many talented poets in this anthology. 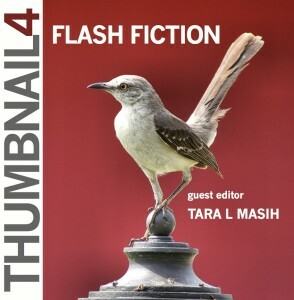 Thumbnail publishes exclusively flash prose (and the odd interview with flash fiction writers) as well as visual art and is “guest-edited by established flash fiction writers.” The widely published Tara L. Masih guest-edited this one. Several of the better stories in this issue are character studies played out as snapshots of relationships, running from a quarter of a page to a page and a half long. “Downsizing,” by Mary McLaughlin Slechta, describes a woman in a desperate situation who encounters a man in need on the side of the road. At first, she drives past, but her guilt and fear of bad karma prompts her to return to help him by jumping off his truck. Her work situation is something like a post-apocalyptic scenario with empty offices and constant fear. She sees the man again and is faced with the choice of whether to help again, but this time, she hits the accelerator and skids past. Slechta has avoided the easy cliché of humanistic morality deftly: her narrator is weighed down with so much concern already (the job, an ex-husband, friends and coworkers in similar desperate situations) that she simply doesn’t have the time or emotional energy to reach out to another human being. Slechta has crafted a telling portrait of America with this brief sketch; gone is the optimism that once ‘saw us through,’ along with concerns like karma; now, it’s about survival. James Claffey’s “Childbirth” is a vivid, one-paragraph sketch of a man hunting water moccasins in order to make their skin into belts. 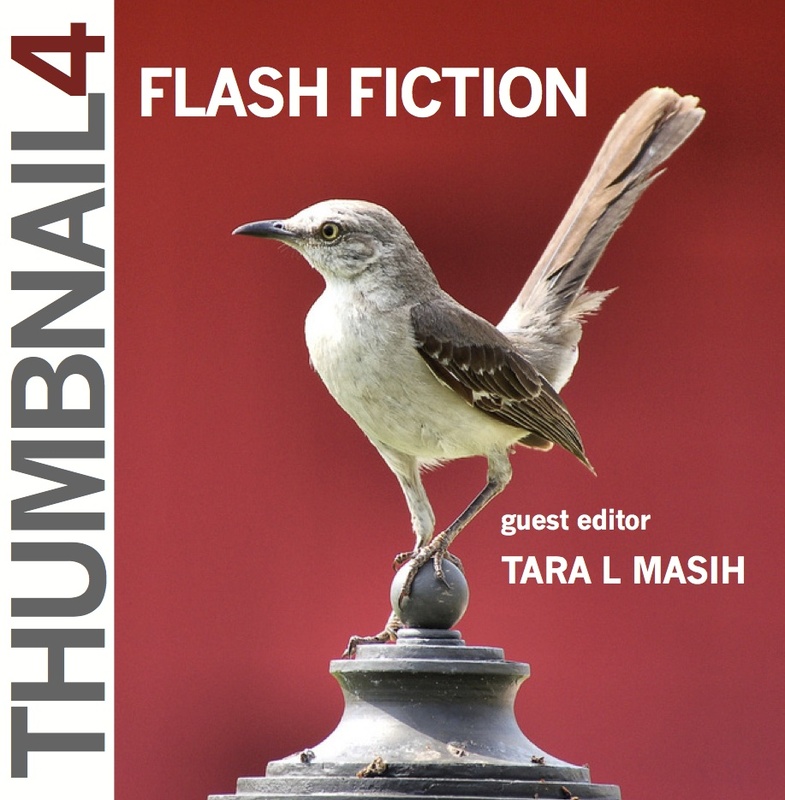 Meg Pokrass includes three stories; “The Highway” is the standout, about a couple arguing on a drive to Reno. Pokrass reveals the nature of the relationship, the characters themselves, and a good bit about the future of this relationship in a crisp, entertaining page and a half. Marina Rubin’s “Gypsy Cab” is a humorous take on a stalwart facing a changed world. Lauren Brazeal’s “3rd Street Promenade” is a vivid love song to place which accomplishes more in a paragraph than many stories do at a much longer length. Likewisem Brazeal’s “Sketch” is a paragraph-long story about squatters that has the weight of an early Larry Clark film. The prolific Randall Brown includes a strong love-lost story, “Yes, I Knew.” And the incredibly talented Kim Chinquee has an interview and an excerpt from her new book, Pretty. …[M]y mother would find him dozing in bliss among the vines…It would take several swats from a broom to rouse the culprit who had left my mother’s garden destitute and at times, it seemed he luxuriated in the prick of bristles on his fur. Did you see anything? my mother would ask at breakfast. No, I said, dissembling my fib with a long drink of juice that did little to slake my growing appetite. (42). This “appetite” he refers to implies some yearning to emulate the cat in its frivolity, its joie de vivre. Ponce accomplished quite a bit in 3/4th of a page. Dinty W. Moore, the editor of the flash nonfiction journal Brevity (whose relationship to the soup of the same name is uncertain) contributed a flash-essay entitled “When Less Is More: The Art of the Nonfiction Flash.” His thesis is that the usual impulse for writers is to expand a piece in order to clarify meaning, but he believes one should do the opposite and trim, sometimes brutally, to get at meaning. He’s absolutely right, but of course both of these options can work, depending on the piece. The answer to bad writing isn’t to make it shorter; it’s to make it better, regardless of length.